The new environmental documentary series, ‘China: Between Clouds and Dreams’, which features the plight of the spoon-billed sandpiper, is premiering on UK television at 7pm on Saturday 5 November on Channel 4. A must watch! This stunning new documentary series was made for Chinese Central Television by the multiple BAFTA winning filmmaker, Phil Agland (River Films). The series comprises five episodes which follow the lives of everyday people in China, interweaving stories of real life human drama with ecology and natural history to capture China’s relationship with nature and the environment. 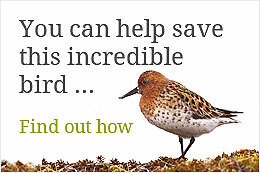 The story of the spoon-billed sandpiper is told throughout the series helping audiences to begin to understand just why this little bird, and other creatures like it are so important in the wider context of nature’s life support systems that sustain us humans. From monks and Snow Leopards on the Tibetan Plateau to schoolchildren and investigative journalists on its polluted coasts and waterways, this is China as it has rarely, if ever, been seen before and shot in spectacular 4k. Episode 1 airs in the UK on Channel 4 at 7pm on Saturday 5 November, with subsequent episodes at the same time on the following four Saturdays . Episode One begins with the arrival of a mystery letter in the classroom of a Primary School in the coastal town of Juegang. The letter is from Russian children, asking schoolchildren in China to protect Spoon-billed Sandpipers on their migration along the Chinese coast. There are only 200 of these little birds left in the world. In the classroom are four budding young journalists, dubbed the ‘Four Musketeers’. They decide to investigate the reasons why the bird is threatened with imminent extinction and their investigation is ultimately to take them, and us, into the very heart of China’s environmental crisis. 4,000 miles west and three miles above sea level lies the Tibetan Plateau, which dominates the whole of East Asia, creating the continent’s climate and providing vital fresh water for half the world’s people. It’s the land of the fabled Snow Leopard, filmed here for the first time in China, and the home of Gama, 13-year-old trainee monk and his teacher, Lama Zhou Zha, a Living Buddha. Their local Tibetan Monastery teaches environmental husbandry to the many Nomads living in the area where extinction threatens many of the wild animals living there. The film also focuses on the central province of Hunan and six-year-old Little Ray. She’s one of China’s 63 million children left behind by parents seeking work in the mega cities. She was born deaf and dumb and abandoned by her parents, but with the help of her teacher and a love for the threatened Finless Porpoise she’s battling to overcome her disabilities. Back on the coast, the Four Musketeers are beginning their investigation for their school newspaper. They discover that the precious mudflats, home to millions of migrating shorebirds and a wealth of marine life are being poisoned by the illegal discharge of toxic waste. Their article ‘Murder on the Mud’ is subsequently published by their school newspaper but turned down by the local Evening News. On the Tibetan Plateau, the Living Buddha takes little Gama on horseback to the giant 21,000’ Mt Geladaindong, to show him the snow-capped source of the mighty Yangtze River. Its huge glaciers are melting as the climate here warms faster than anywhere else on Earth, threatening the livelihoods of four billion people below. Little Gama’s journey and his growing understanding of the environmental importance of his homeland takes us closer than ever before to the beating heart of Tibetan people and to the reasons why this mighty plateau is so important to the whole world. Back in Hunan, Little Ray and her teacher visit newspaper reporter Xu who has dedicated his life to saving the porpoise. He takes the teacher out on to the giant Dongting Lake to reveal the devastating consequences of the excavation of one million tons of sand and gravel every day – polluting the waterways and affecting the wildlife. The final part of the first film explores the huge price China is paying for its phenomenal race to urbanise – from the environmental destruction of places such as Dongting Lake that supplies the raw materials for the building of the country’s new super cities, to the loss of such precious creatures as Spoonie and the Finless Porpoise.